Are you looking for cheap tickets for your travel this July to September 2017? Check out the Cebu Pacific seat sale 2017 to local and international routes! 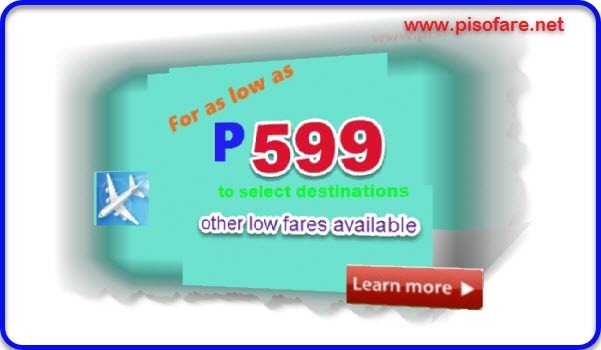 Domestic promo fares as low as P599 can be book for new routes Cagayan De Oro to Bacolod or Tagbilaran. Sale tickets from Cebu to select destinations are cheap at P650 and P699. Fly from Manila, Cebu, Davao, Iloilo to many local places for only P1,099. Will you be going abroad for your vacation? Travel to Macau, Taipei, Brunei or Kota Kinabalu from Manila for as low as P1,599. Visit Singapore for only P1,599 from Cebu, Clark, Iloilo or Davao. Other international destinations are also covered by the sale. Travel period for this promo include July, August, September 2017. Promo period is until March 16 or until seats are available! Book your tickets fast! 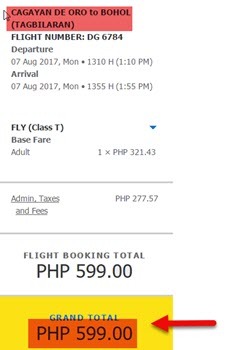 We access online and get a sample booking for Cebu Pacific promo fares and shared it below. 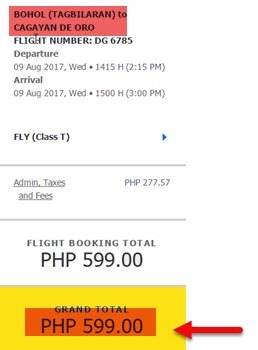 Cebu Pacific promo tickets are valid for one-way trip and include the base fare, Web Admin Fee, taxes and fees as well as 7 kilos hand carry bag. As there is no checked baggage allowance, it is recommended to buy a prepaid checked baggage during booking to save on baggage fees. Purchasing of baggage allowance and other Add-ons like buying meals or select your favorite seat can be done up to 4 hours prior to flight departure by visiting “Manage booking” section of Cebu Pacific online booking. To get the Cebu Pacific sale ticket fast, book online at www.cebupacificair.com. Promo code not needed when booking. You may also purchase the low fares at Cebu Pacific ticket offices and accredited travel agencies and booking offices. Another way of getting the promo fare is by calling Cebu Pacific hotline at telephone numbers: (02) 702 0888 (Manila) or (032) 230 8888 (Cebu). Are you in Metro Manila, here is the List of Cebu Pacific Ticketing Offices in Manila. Checked this Luzon Cebu Pacific Ticket Offices. For the Visayas, this is the List of Cebu Pacific Visayas ticket offices in the area. Mindanao readers, buy the Cebu Pacific promo fares in these Ticket Offices in Mindanao. Have you check your calendars when you would like to fly? Read the 2017 List of Holidays and Long Weekends to guide you. Book your tickets now! Sale seats are limited and may not be available on all flights! For more promo fares 2017 to 2018, PISO FARE 2017, PISO FARE 2018, travel tips and updates, Visit and Follow our Facebook: PISO FARE TICKETS!! !